The Stanley Show that closed at Islington last night saw the introduction of very few novelties, but a considerably excellent increase in the standard of the motor cycles, as well as in the main a considerable reduction in price. 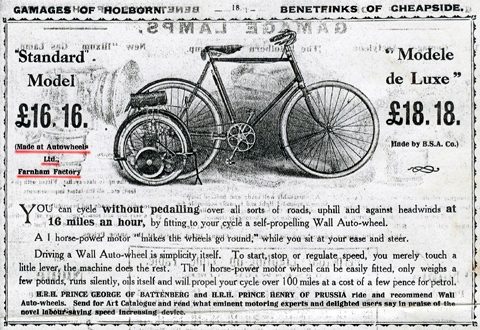 The chief novelty of course was the introduction of the Wall Auto-Wheel that is made at Birmingham and aims at enabling any who desire to transformm an ordinary bicycle into a power-driven machine by taking a supplementary wheel and attaching it bya fork to the side of the machine at the back. The price is designed to be exceedingly moderate, so that the invention may be within the range of practically all purses, for the whole accessary, including motor and ignition, will be supplied for the price of a ann ordinary bicycle a few years ago. The power unit is absolutely independent of the cycle, being attached to it by means of two clamps, one to the offfside back fork and the other to the offside chain stay. The motor is a small two stroke engine fed by a floatless carburettor, the flywheel is contained in the hub of the wheel, and the gearing is on the epicyclic system. …As one season succeeds another, there are more and more motor features in each Stanley Show, until one imagines that about five years hence when one speaks of a cycle, it will be taken for granted that a motor-driven machine is meant. As you can see from the extract of the show report, above, the Auto-wheel made its debut in 1909, to great acclaim. Note the comments at the end of the article. The photo above shows a Wall Autowheel attached to a Dursley Pedersen on the Pioneer Run in the 1950s. 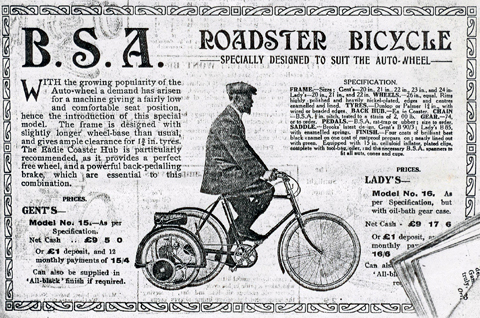 Dursley Pedersen advertised one of their machines fitted with a Wall Autowheel in their 1914 catalogue. The article below, from 1982, shows it advertsied in the Wall Autowheel catalogue. The Dursley Pedersen/ Wall Autowheel outfit mentioned in that article is the one featured here. My friend Derek’s father restored this Wall Autowheel and Dursley Pedersen Outfit in the early 1980s. I bought it from him earlier this year. We have recently serviced it, and it’s ready to ride. The frame is nickel plated. All Pedersens were nickeled under their paint; the nickel on this frame appears to be mostly original, with a few parts such as the forks re-nickeled, presumably during its c1980 restoration. It has been fitted with good condition nickel wheels and an Eadie Coaster pack-pedal brake. There is a conventional brake too. The chainwheel is a nickel Chater Lea. The only chrome part on the bike is the pedals. The fitting bar between the Autowheel and the rear stay/ rear stays is stainmless steel. Judging by the screw on caps, the throttle/ advance-retard lever would appear to be an original item. It has a V5C registration document. Both the Dursley Pedersen and the Wall Autowheel are in good condition throughout. Both are obviously rare and sought-after items in their own right, the early (ie pre-1914) example of the Wall Autowheel being much harder to find than a Dursley Pedersen. It is not a very practical combination, as the Dursely Pedersen does not really lend itself to motorisation. Nevertheless, this set-up appeared in both the Autowheel and the Dursely Pedersen catalogues, so this example is therefore of serious historical interest. For those of you who forgot your school history lessons, HRH Prince George of Battenberg who zipped around on a Wall Autowheel in his twenties (born 1892) was none other than George Mountbatten (he relinquished the above title in 1917). His sister was Princess Alice, (mother of Prince Philip, Duke of Edinburgh) and brother was Louis Mountbatten, 1st Earl Mountbatten of Burma.